Fisher-Price, which is owned by Mattel, has voluntarily recalled its Rock ‘n Play Sleeper after the child’s furniture piece was linked to 30 infant deaths. Read on to learn about what the experts have to say about babies sleeping in structures that restrict movement. According to the company’s website, the Rock ‘n Play Sleeper is designed to soothe babies to sleep. 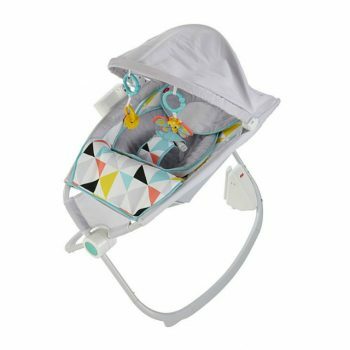 The device provides up to 20 minutes of calming sounds all while sending vibrations through the structure that further prepare the baby for sleep. There is Smart Connect technology associated with the Rock ‘n Play Sleeper that works to make every baby’s experience unique. Although meant to calm the child, Fisher-Price’s product has reportedly done the opposite in terms of a good night’s sleep. Thirty infants died as a result of restraints constricting their airways and preventing the babies from changing positions. Mattel does note that the children who passed away were not properly restrained in the sleeper. Still, experts encourage parents to steer clear of any device that restricts movement while a baby rests. #FisherPrice and the CPSC have issued a consumer alert on a popular baby sleeper. The Rock 'n Play Sleeper has been linked to ten infant deaths since 2015. Tap the link in bio for the full story. The AAP’s president, Kyle Yasuda, was especially adamant to get Fisher-Price’s Rock ‘n Play Sleeper off the shelves as he believed that Mattel did not do enough to protect consumers. “When parents purchase a product for their baby or child, many assume that if it’s being sold in a store, it must be safe to use,” Yasuda said in a statement. You can get the full list of Mattel and Fisher-Price safety alerts and recalls here. The post FISHER-PRICE RECALLS ROCK ‘N PLAY SLEEPER LINKED TO INFANT DEATHS appeared first on BCK Online.